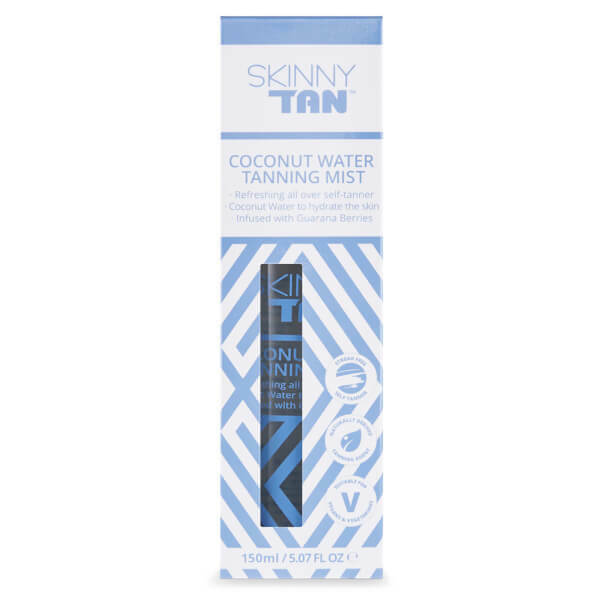 Create a natural-looking, golden glow with SKINNY TAN Coconut Water Tanning Mist, a medium self-tan that develops gradually to lend skin a radiant-looking finish. 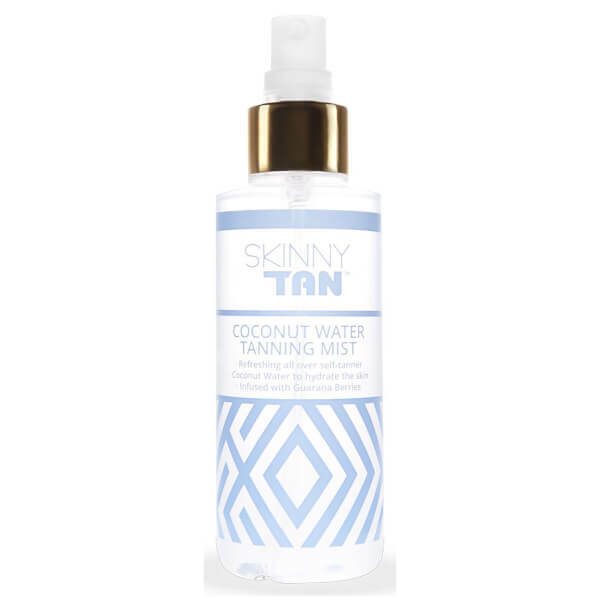 Quick-drying and infused with an exotic Coconut fragrance, the tanning mist combines a naturally-derived tanning agent with nourishing oils to leave skin looking illuminated and hydrated. The self-tan has no visible guide colour and will develop gradually as you wear it. Suitable for use all over the body, including the face, neck and décolletage. 1. Exfoliate skin using SKINNY TAN Pre-Tan Primer and Exfoliating Mitt for a streak free, even tan. 2. Ensure skin is completely clean and dry. 3. Prior to application lightly moisturise knees, elbows, hands and dry areas. 4. Spray directly onto skin and blend lightly using our SKINNY TAN Dual Tanning Mitt. Use the natural shine of the product as a guide to ensure full coverage. 5. Allow tan to dry. 6. Dress and go. No shower necessary. 7. Reapply until you reach your desired level of tan. Note - not a sunscreen and does not protect against sunburn. Aqua, Dihydroxyacetone, Glycerin, Cocos Nucifera (Coconut Water), PEG-40, Hydrogenated Castor Oil, Dimethyl Isosorbide, PEG-7 Glyceryl Cocoate, Parfum (Fragrance), Sodium Metabisulfate, Cocos Nucifera (Coconut Oil), Ethylhexylglycerin, Xanthan Gum, Ascorbic Acid, Fructose, Paullinia Cupana (Guarana) Seed Extract, Phenoxyethanol, Sodium Benzoate, Potassasium Sorbate.